Join the discussion on our forums! Come discuss Vex Crow over in our dedicated Vex Crow discussion topic. 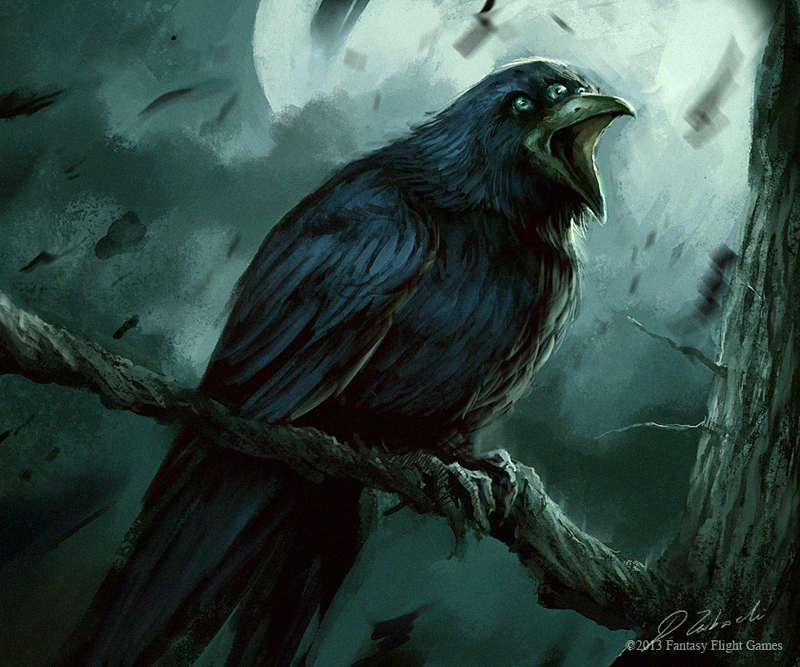 As birds of ill omen, these crows often summon Doomsayers. Let's be honest, competitively this can often be a worse version of Violet Teacher if not for Cobalt Scalebanes which might get 2/3s to buff. I'd say it's of at best in a tempo/midrange deck and really winmore with such low health -- Heck, you almost might as well play Archmage Antonidas if you need to recycle spells. Cards (especially so for maintaining tempo on board, going into the late game) are a much more important resource than this. 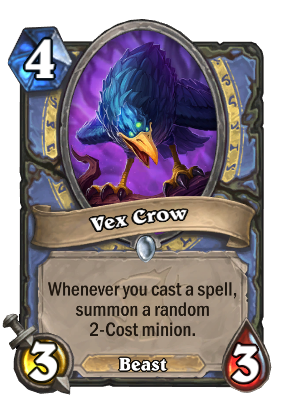 Edit: to be clear anything with stats worse than a vanilla minion, and requires another card to get value isn't good. Consider Fire Plume Phoenix which includes a free Zap! -- those are the sorts of card you want, not the other way around like this combo. So that's why it's playable but really bad for you. Played against an aggro mage who got Doomsayer from this guy. 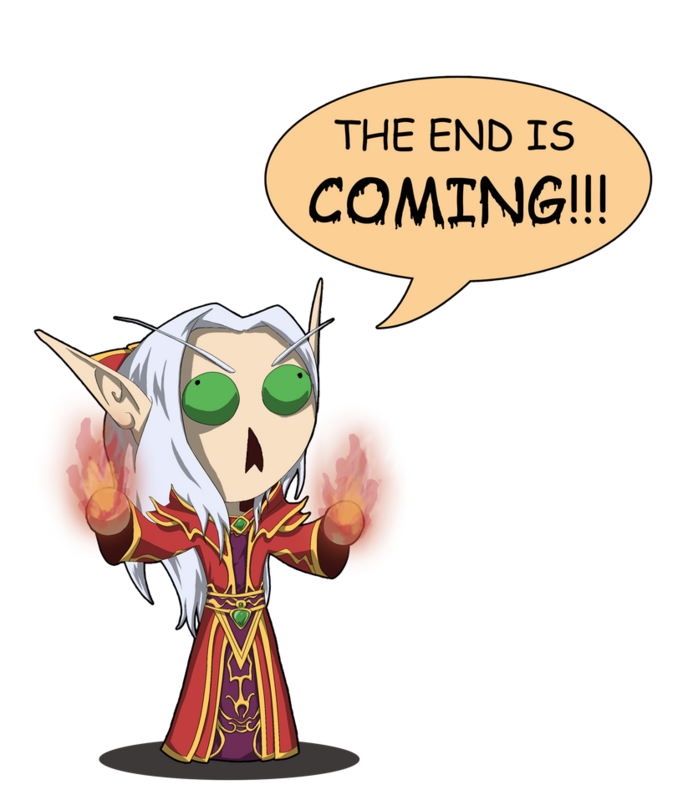 Then they just gave up completely when the second one spit out Lorewalker Cho. Unironically a good card... until it betrays you. Whenever you cast a spell, summon HODOR. I love this card! It always brings me a swing turn in aggro mage. Got a radiant elemental and tainted zealot in the first two summons, proceeded to spam spells until my board was full. We have 3 eyes raven now! wow! Is the replacement for medivh in big spell mage? I sure hope not. in some cases, you want the end to come. Not as attached to his minions like the Vel Crow. This card seems fun and viable if there's some nice low cost spells to play in the meta. With Aluneth equipped maged could play cheap spells to flood the board and then push for damage but why should we bother since mage can just play expensive burn that doesn't die to cheap removal? It will be fun to see Doomsayers on Trolden videos though. Easily removed but turn 5 but could be useful if board presence is required.